Paeonia Belgravia is without a doubt one of the most beautiful peonies on the market. It’s the only variety that can compete with the better-known Command Performance, a distant relative of Belgravia. 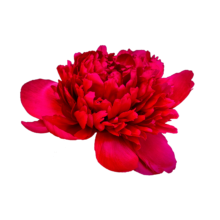 The biggest differences between these two peonies is that Belgravia stays red after blooming and that it’s less susceptible to damage. Belgravia is a double-flowered peony with bomb-shaped blooms. The flowers are filled with thousands of petals. Belgravia blooms mid-season and has strong stems that aren’t prone to abnormal curvatures. The buds are quite large at 40 mm wide and bloom into flowers that can have a diameter of 25 cm. Quite the big bloomer! Use a clean knife to cut the stems diagonally and put the flowers in lukewarm water. Make sure that the vase is clean and the water is free of leaves. If necessary, add a small amount of chlorine to the water. Take good care of Belgravia and it’ll reward you with spectacular flowers and a vase life of about ten days.